AddApptr makes your life easier! Click here for the "How it works" video! It’s quick, easy and hassle-free! And looking for passionate, talented people! 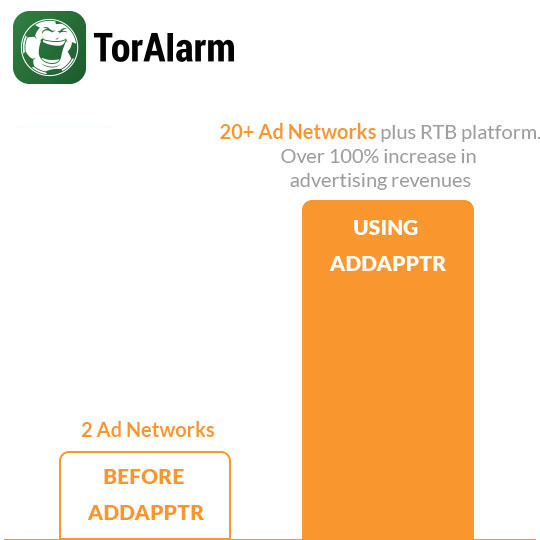 AddApptr gives you access to all premium Ad Networks and over 1.000 advertisers via Real Time Bidding (RTB) as well as premium ad servers. Get the maximum $$$ out of your ad inventory – AddApptr will optimize revenues for you. 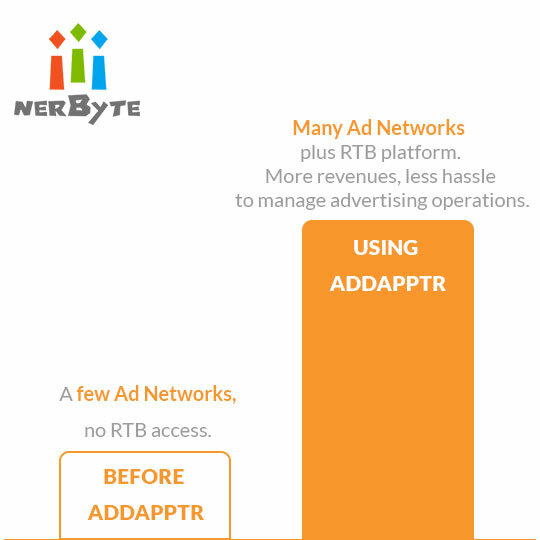 AddApptr bundles the world’s top mobile Ad Networks in a single solution. Over 1.000 advertisers are bidding on your mobile ad inventory, on a real time programmatic market place. AddApptr optimizes both mediation and RTB channels and maximizes your ad revenues. AddApptr is one of the few members of Google’s Certified Publishing Partner (CPP) program. This means that AddApptr has access to many resources to improve management of Google products such as Google Ad Manager, the largest RTB exchange in the world. AddApptr can help publishers to optimize their set up of Google products in order to make sure that maximum results are achieved. AddApptr always delivers the highest possible fillrate. Only top advertisers and Ad Networks are integrated in the AddApptr solution. 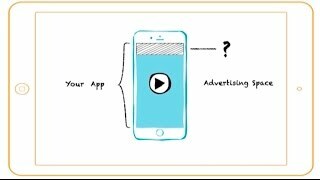 AddApptr make sure that at any time the highest paying ad is displayed in your app! The AddApptr dashboard delivers all important values and KPIs at a glance. AddApptr gathers all relevant data from all partner Ad Networks via server side reporting interfaces. As a result of all the efforts, Hornet and AddApptr now manage a sophisticated global ad tech solution, returning maximum revenues and giving Hornet the flexibility and scale to reach the next growth level. We trust AddApptr to monetize over 1 million football fans in our apps. Since integrating AddApptr, we increased our advertising revenues by over 100%. Lep’s World has reached over 100 million downloads. 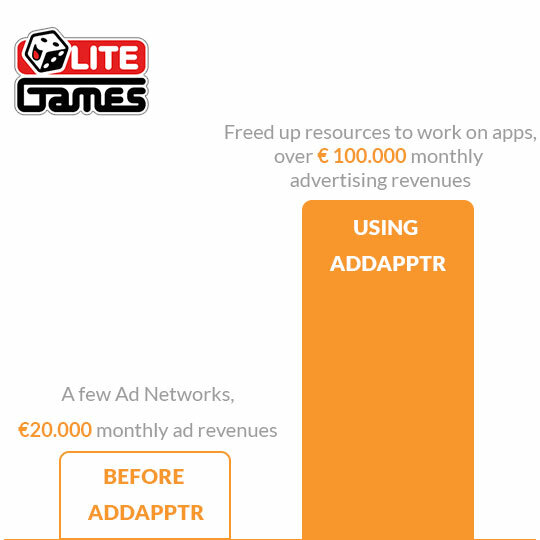 AddApptr’s high service and RTB Platform have increased our overall advertising revenues by a lot. 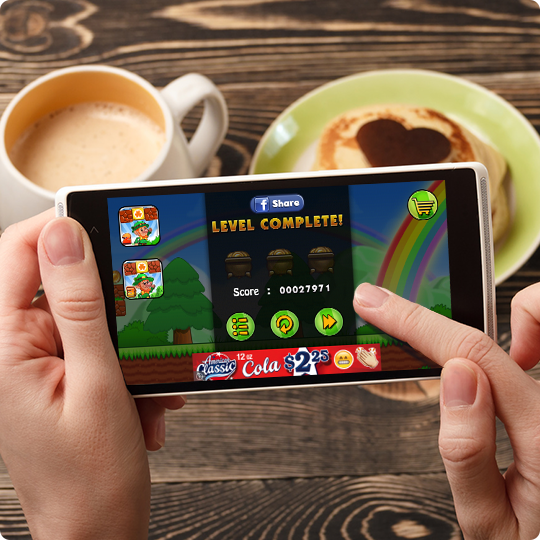 We trust AddApptr 100% to monetize all of our titles both on iOS and Android. The results are simply amazing, AddApptr has generated millions of revenues for us! Integrating the RTB Platform was easy and quick. We just updated the SDK and AddApptr took care of the rest. We were delighted with the much higher revenues! +161% revenue growth with AddApptr. Take a look at the full case by clicking the button below.